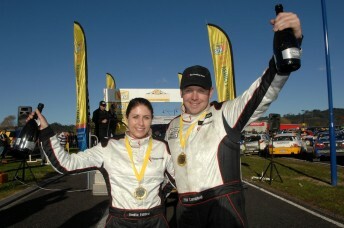 The Tauranga pairing of Phil Campbell and Venita Fabbro have taken their maiden victory in the Brian Green Property Group New Zealand Rally Championship driven by VINZ, by winning the inaugural VINZ Gold Rush Rally of Coromanel. Campbell and Fabbro guided their Roofing Store Mitsubishi Lancer Evo 9 through the 135 kilometres of twisting and demanding stages in the Coromandel ranges, finishing the event with a winning margin of 17.3 seconds over fellow Tauranga driver David Holder. Te Aroha driver Graeme Featherstone completed the overall podium finishers. It was a well-earned victory for Campbell and Fabbro who have demonstrated great speed in the 4WD Mitsubishi which has been a new car for the Tauranga driver this season, after stepping up from the 2WD categories previously campaigned. “We are wrapped with the win, it’s a fantastic result for our team. It was a tough rally, we took a couple of stages to find a pace we were happy with, and then tried to be consistent in the afternoon,” stated Campbell at the finish. The Whitianga based event, a new addition to the National Rally Championship calendar was held in beautiful summer like conditions and provided a real challenge for teams. National Champion Richard Mason, hunting a fifth consecutive round win, started fast and held the rally lead by over two minutes. Disaster struck for Mason in the 24 kilometre Castlerock test when a left rear toe link broke on his Subaru, leaving him sidelined on the stage. Nelson Subaru driver Ben Hunt had been running second to Mason until he punctured a tyre, the problems for the Subaru drivers handing the advantage to Campbell who maintained it through to the finish with a fast consistent run. Second place for David and Ben Hawkins earned the pair their fourth consecutive podium result this season, also securing the 2014 Junior Title with one round to spare. Graeme Featherstone in third continues the run of impressive results for the Te Aroha driver, and in fourth with his best ever National championship result was Auckland’s Clinton Cunningham and Greg Ruka. Ben Hunt recovered from the time loss with puncture to win the Power Stage and finish fifth. The class battles also resulted in a number of class champions being crowned for 2014. Kaiapoi’s Marcus Van Klink in the spectacular Group B Mazda RX7 secured the BNT Historic championship for the second time, Timaru’s Darren Galbraith the Gull Rally Challenge 4WD title, and Auckland’s Jeff Torkington the Rally Challenge 2WD title for 2014. The 2WD categories for the round were dominated by Hawkesbays Max Bayley in 2WD, following another impressive drive and Open 2WD to Cambridge Toyota 86 driver Brent Taylor. The 2014 Brian Green Property Group New Zealand Rally Championship driven by VINZ, now heads to the Manawatu at end of September for the final round, the Daybreaker Rally. Rally of Whangarei, 11-13 April; Rally of Otago, 10-11 May; Canterbury Rally, 01-02 June; Rally Wairarapa, 28 June; Rally Coromandel, 23 August; Daybreaker Rally (Manawatu), 27 September.